Photo of the day: BBQ skewers @ night market in Hanoi. Photo credits: Aaron. We took it easy this morning and enjoyed a nice breakfast at the hotel before packing up to go to our next destination: Hanoi, the capital of Vietnam. I actually felt like something simple, such as eggs and toast but decided to fill up on a more substantial meal in fear of not having my next real meal until we reach Hanoi (flashback: trip from Hoi An to Hue). I ordered the pork soup to start and then the fried noodles with chicken as my main. Of course they also gave us a platter of fresh fruits to finish the meal. The soup was flavourful but a little on the salty side for me. It was full of little cubes of potatoes, carrots and pork. 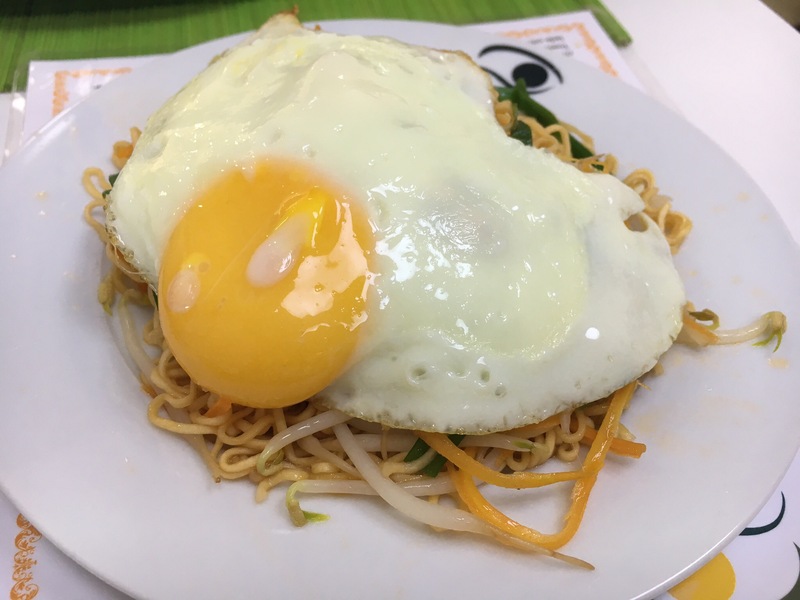 The fried noodles, was made with really nice-textured noodles and was loaded with bean sprouts, carrots, green onions, a few chicken slices as well as a perfect sunny-side up egg on top. Then off we went to the airport, which was actually quite far away. Our hotel helped us organize a private car and the driver was super friendly and was telling us how he was driving some people this morning who were partying too hard last night and still had drinks in their hands when they were in his car. So funny. 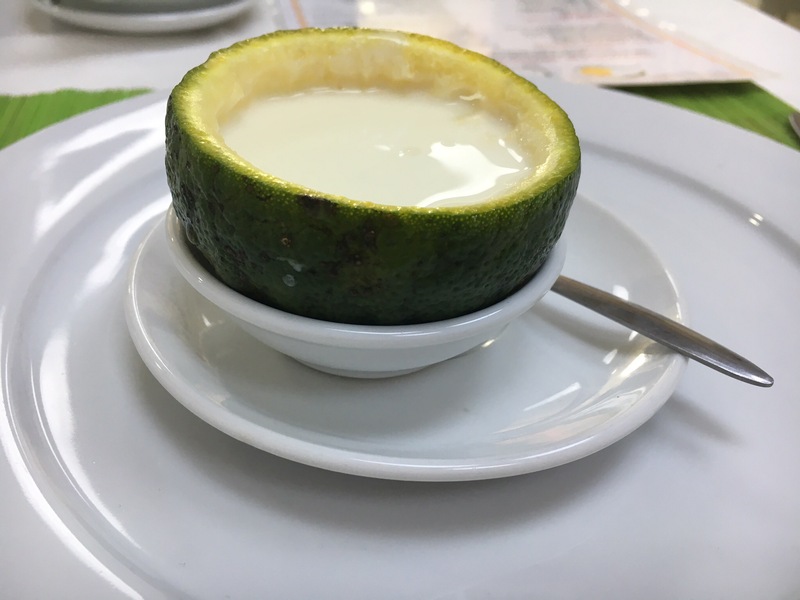 Our overall impression of Hue is that it is still an older, smaller city and a lot of the restaurants/cafe were not listed on Foursquare or tripadvisor. You really need to do some digging yourself to find good eats here. This is probably a good place for history lovers and sightseeing fanatics to join a tour and check our the various mausoleums, pagodas and other sights surrounding Hue, but Hue itself is not vibrant enough to entice me. We had around an hour until our flight, so we managed to sit down at a cafe/restaurant (Lucky Cafe) to get some work done and some food as well. I had some Vietnamese green tea with some beef congee and Aaron had some “Royal tea Hue style” with some fried rice. I enjoyed my green tea and it went well with the super flavourful beef congee. Compared to Chinese-style congees, the Vietnamese congees I’ve had is not bland at all. It is like they made congee, then mixed it with Pho broth. 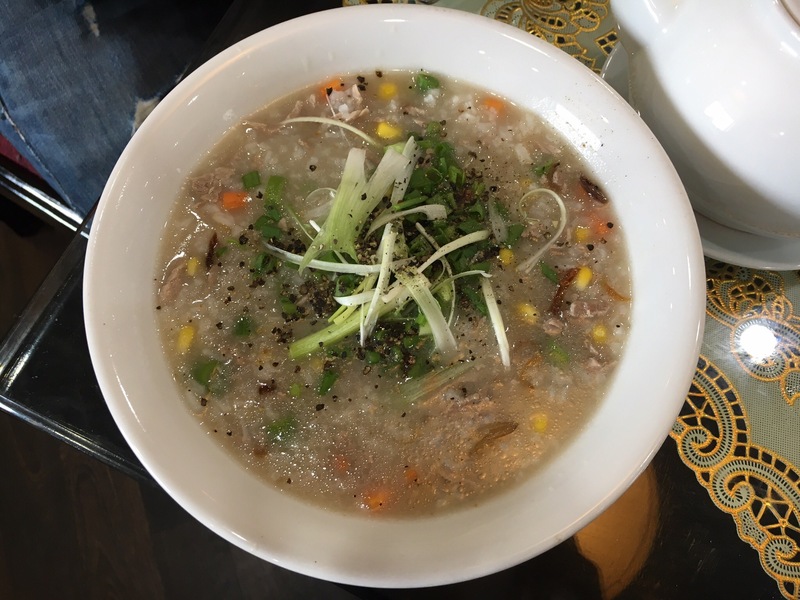 Especially with the tasty little pieces of beef, it did remind me of a congee version of Pho. Aaron felt the fried rice was not bad and found that their rice is more sticky than usual. It was an uneventful and quick 1 hour flight to Hanoi, which made me really glad we flew instead of enduring 16 hour+ of train ride. I read that there were a lot of taxi scams at the Hanoi airport, where drivers will drive you to “copycat” hotels with similar names to the ones you booked or tell you that your hotel is closed and bring you to another one so they can get commission. As a result, I pre-arranged transportation through the hotel. It took some time for our driver to find us, requiring me to call the hotel but all worked out in the end. Again, the airport is quite a ways away from the central part of the town. We are staying at the “Old Quarter”, close to where a lot of the attractions are. My first impression of the Hanoi, is that it reminded me of the Chinatown in Vancouver with the old buildings and many Asian store fronts, along with the more narrow streets. Of course the traffic is a lot more congested here compared to Vancouver. Again, we were greeted like royalty at the hotel with welcome drinks and snacks. 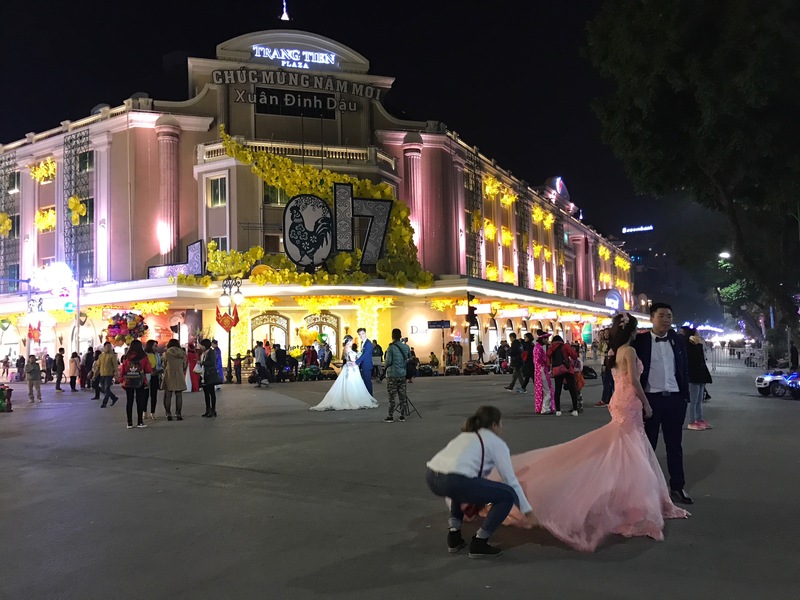 They were very patient with going through the map of the surrounding areas, recommendations for good foods and festivities to check out tonight and reminding us to be cautious of our belongings since it is near Tet (the Vietnamese New Year) and the streets will be crowded. 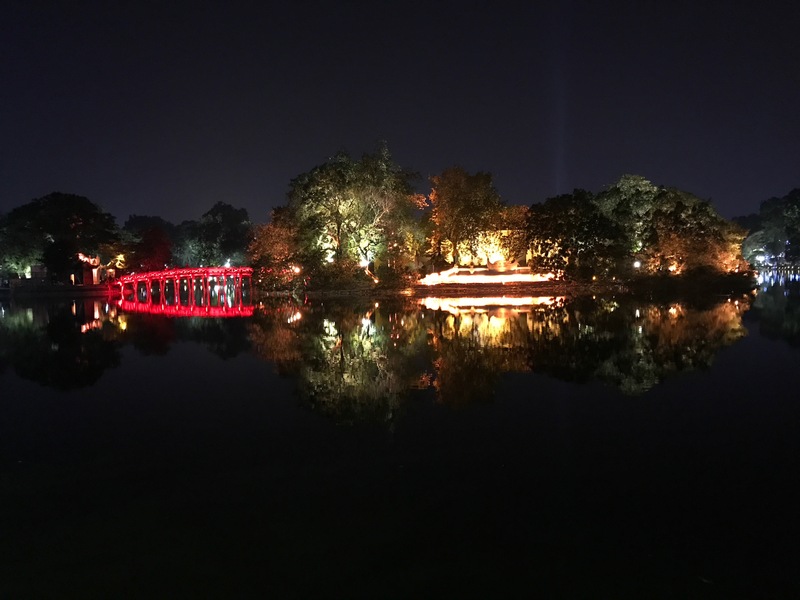 We weren’t hungry yet, so we decided to take a walk around the Hoan Kiem Lake. It was so gorgeous with beautiful lights and a nice park. The best part was that the roads were closed off during the weekend so we didn’t have to worry about avoiding motorbikes and was able to truly enjoy our walk. It was nice to see young street dancers performing, locals selling street food, children playing on little electric carts, and buskers, asking for money “to continue their trip around the world”. You can also see that new year decorations are starting to be put up throughout the city, with bright reds and yellows everywhere. After working up our appetite from that nice walk, we decided to try one of the hotel recommendations for “local food”. We went to Bun Bo Nam Bo Hang Dieu. As soon as I saw the assembly line of vermicelli bowls, I knew we were at the right place. They only had one main dish on their menu – Bun Bo Nam Bo (beef noodle salad) – always a good sign. We ordered 2 along with 2 of their local beers and waited 1 second before they brought over the warm bowls of vermicelli. Our friendly table mate saw that we were new to this and reminded us to mix well before eating. It was a flavourful party in my mouth. I had a good bite of cooked bean sprouts, crunchy peanuts, marinated beef, carrots, papaya, other vegetables, all with the vermicelli covered in this amazing fish sauce. It is apparently a southern Vietnamese dish but I guess we missed it while we were in HCMC. 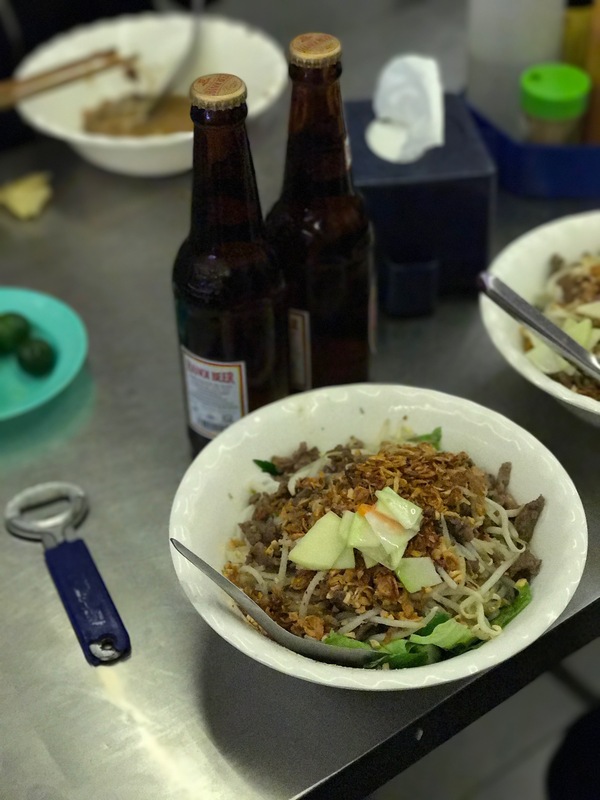 This was definitely one of my favourite meals in Vietnam and is making me fall in love with Hanoi, if the beautiful night stroll around Hoan Kiem Lake didn’t do it already. Oh yeah, and did I tell you our entire meal was only ~$10 CDN? Bun Bo Nam Bo + Hanoi Beer @ Bun Bo Nam Bo Hang Dieu. Photo credits: Aaron. We were told that there was a weekend night market going on, so we had to check it out. It was not difficult to find as we saw the closed off streets on our way to the hotel from the airport. By this time of night, it was full of people as well. There were stalls and stalls of merchandise ranging from accessories, clothes, shoes, bags, and of course street food. It is definitely a lot more comprehensive than what you would find at a Vancouver or Ottawa night market. Popular items on the street food menu include BBQ skewers, home-made popsicles and random Korean-style snacks, such as spicy rice cakes and kimbaps (as well as deep fried kimbaps!). We decided to try some of their spicy flavoured roasted peanuts (delicious, so we got a small jar) as well as the BBQ skewers. The skewers we got was apparently chicken and it was good. The meal was very-well marinated and the quality of meat was good. It was perfectly cooked and the texture was amazing. The going price here is a little more than something we would get in KK, Malaysia but Aaron couldn’t have enough, so we ended up getting more at another stall. And that ends our eventual first night in Hanoi! It felt nice to finally be in a big city again with a lot more food options to explore! Oh Lord that sounds all delux. Oh no. So.sad. Anyway don’t eat Dog! Seema to be somehow a delicacy over there.